The process of protecting the moisture of concrete surface and enhancing the hydration of cement is known as curing. The physical properties of concrete totally depend on the hydration of cement. If curing is not done properly concrete will be failed to acquire its full strength. Improper concrete curing may also lead the concrete to crack. By this method, the evaporation of water is locked in the concrete surface. It also protects the surface from heat, wind etc. In cold climates, it prevents the concrete from freezing by preserving heat of hydration of cement. In this method, the concrete surface is covered with wet gunny bags or waterproof papers to avoid water loss and to protect the concrete from further damage. This method gives satisfactory results for curing of concrete slabs and pavements. In this method, water is sprayed on the concrete with the help of nozzles at proper intervals. This method is not so effective due to the difficulty of keeping the concrete surface be moist all the time. Ponding is the most common method that is adopted for curing of floors, slabs, pavements etc. In this method, concrete surface is first covered with moist wrapper for 24 hours. After that, the covers are then removed and small amount of clay puddles are constructed around all the area. Then water is filled for final curing. 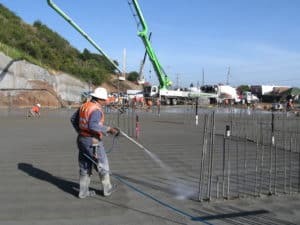 In this method concrete surface is covered by waterproof membranes or sealing compounds such as bitumen emulsion, wax, rubber latex emulsion, water repellant, plastic films etc. The membrane protects the water loss from concrete. It is seen membrane curing for 28 days give equivalent strength to two weeks moist curing. Steam curing is done by increasing the temperature of concrete in wet condition. This method allows the concrete to achieve its full strength within a short time, thus curing is also finished within short time. Steam curing is mostly adopted for the production of precast members. It therefore means that it is not good to cure a bleeding concrete?